Cryptotrader.online is a service that automatically trades between USD and Bitcoins. Cryptotrader.online has a smart trading engine that, on the basis of financial analysis, determines automatically when to buy and sell. To join the service you do not pay monthly fees or setup costs. What you do pay is a 20 % fee of the gain. So 80 % remains for yourself. The yearly yield of the trader is optimized by performing simulations with real historic trading data of Bitstamp (> 12 million trades). The yield of the trader depends strongly on the bitcoin market. When the price strongly fluctuates, the trader makes the best yield. In recent years we have achieved an average return of more than 2% per month! Warning: Yield generated in the past is no guarantee for the future. 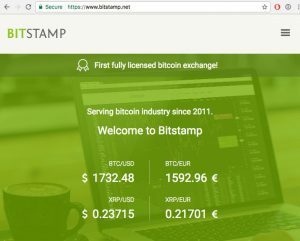 The USD that are needed to buy bitcoins, and the bought bitcoins, are on the bitcoin exchange Bitstamp.net. 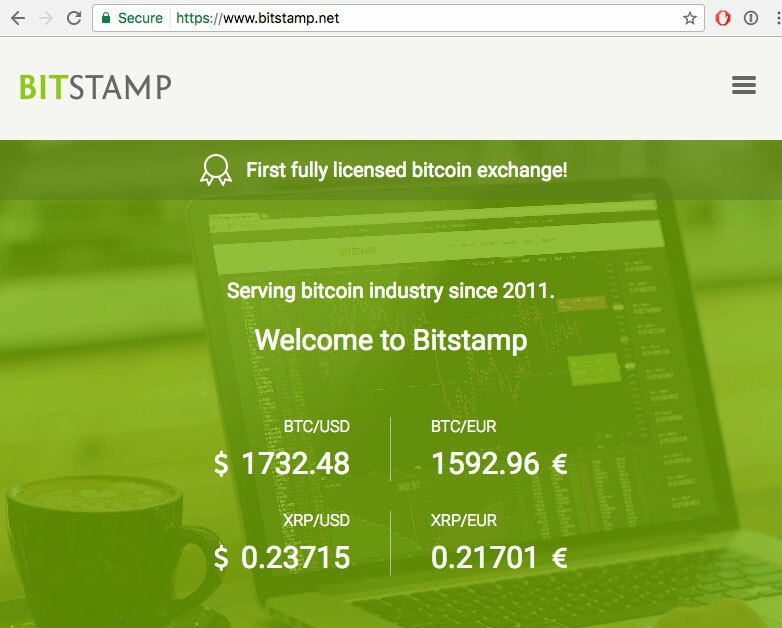 Bitstamp is one of the most known bitcoins exchanges with a fulll license. They have a good safety protection and user accounts with Two-Factor Authentication (2FA). Two-Factor Authentication makes it much more difficult for hackers to access your account. Please pay attention that you are always running a risk when the bitcoin exchange is hacked. It is important to note that our service Cryptotrader.online cannot transfer your money or bitcoins. It can only sell and buy bitcoins. The money in USD and bitcoins always stay on your account at the exchange. 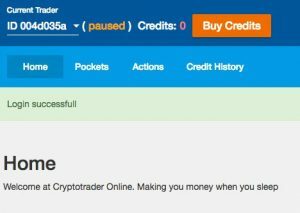 So no money of yours is at Cryptotrader.online. How can Cryptotrader.online trade on behalf of me? As soon as you have an account at bitstamp.net you can create an API key. With this key, once you give it to us, we can trade for you. Give this key has limited rights so that we can only trade and not transfer your money to an other account. In the section “Getting Started” is explained how to create a key and how to set the correct rights for it. Once you are registered at our service, you will get a mail with a link to the cryptotrader.online which you need to create your own password. Once logged in, you see in the top left on your screen the your unique trader ID and it’s status. The trader is paused since the total credits is 0. Before you can start, you need credits. 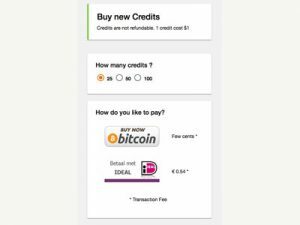 How to pay for credits? Cryptotrader.online works as a pre-paid model, comparable with call-minutes on a cell phone. You buy credits (25, 50 or 100) and as soon as the amount of credits is positive your trader will start automatically. As soon as the trader generates a profit, the credits (being 20 % of the gain) will be booked off your credit amount. Example: Say you gain 10 USD then 2 credits are taken. When the total amount of remaining credits is at 0 or below, the trader pauses. You will be notified by email that your credits are low. You need to buy credits. 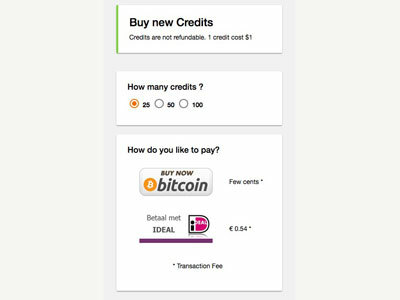 By pressing “Buy credits” you can buy new credits with bitcoins or iDeal (Dutch banks). As soon as the payment has been received the credits are added and the trader starts. Tip: Make sure that you have enough credits so you do not miss out on a good buy / sell oppertunity. Once pressing the “Buy Now Bitcoin” button, you get into the screen where you can pay with bitcoins. 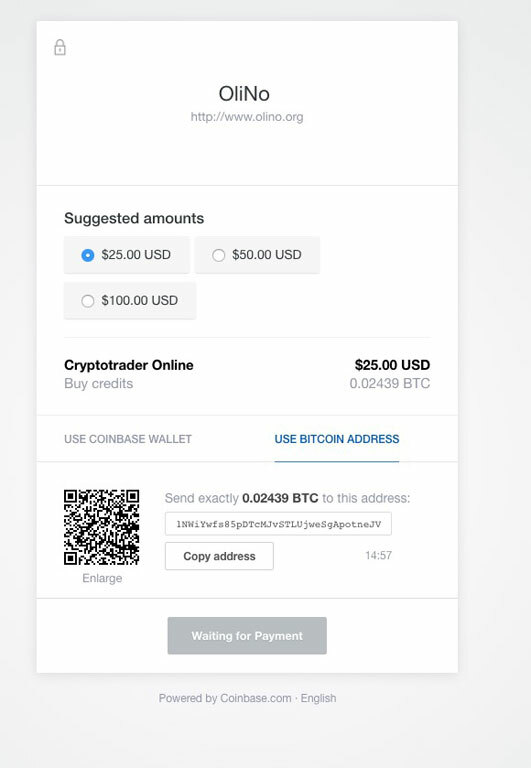 By scanning the QR code using the bitcoin wallet software on your Phone, you can easily pay. Normally the credits are added within a couple of minutes, depending on the bitcoin network. It might, at busy times, also take up to 2 hours. 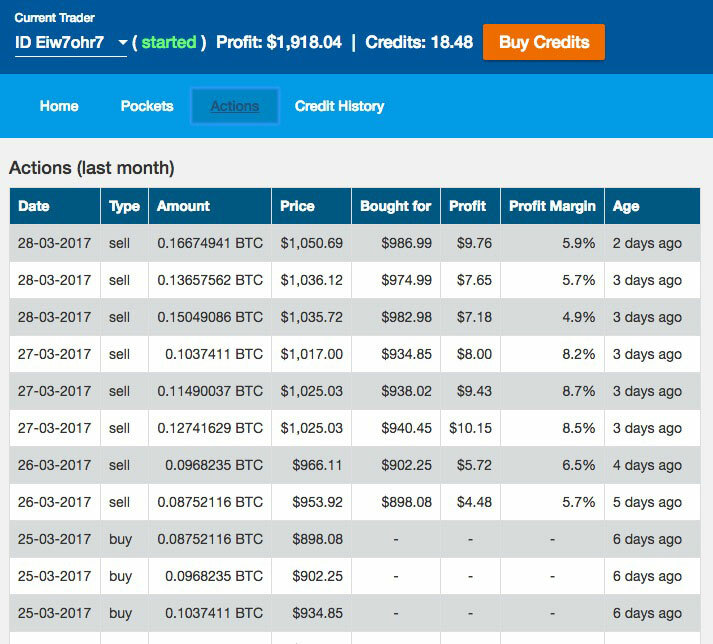 Upon receival of the bitcoins the credits are added and when the credits are above 0 the trader starts. 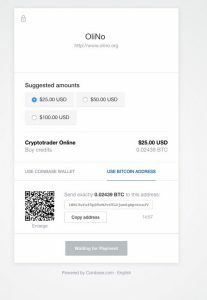 Once the bitcoin payment has been received you will get an invoice for your own administration. That invoice has then already been paid. Here an example of a trader that already has been running some time. 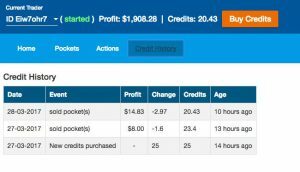 There has been made a profit of 1900 USD and the person has more than 20 credits left. The trader is started. You will receive automatically an email when the trader buys or sells bitcoins for you. The email contains information how many bitcoins are bought or sold, the price paid or received and the profit made (when there was as sell). This way you keep informed on the actions of the trader. The trader will buy automatically bitcoins when there is a good buy oppertunity. To reduce the risk, it will buy new bitcoins for 10% of the available USD budget. The trader can determine a good buying oppertunity but it can not predict the future. So it is important to not use the full USD budget, because a even better buying oppertunity can follow. Every buy of bitcoins is stored in a so called pocket. On the pockets page you get an overview of all unsold pockets. 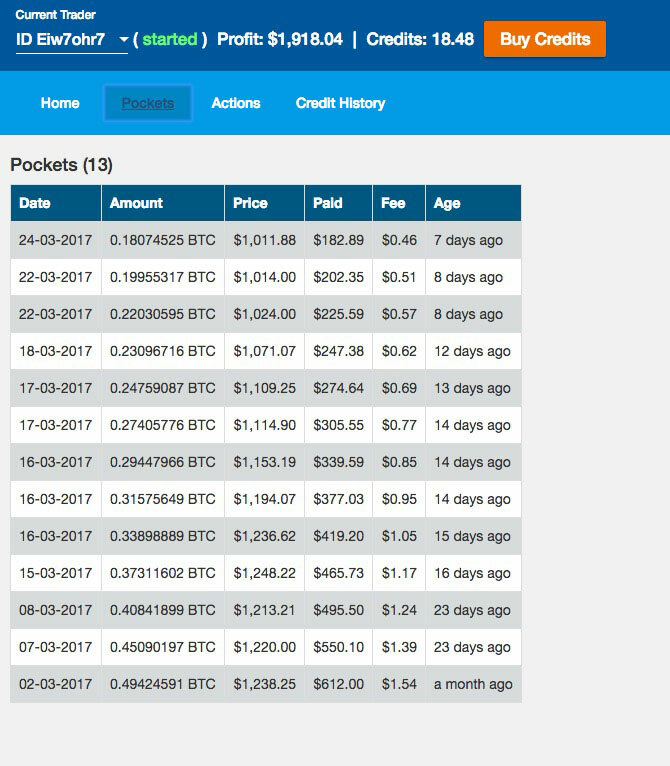 You can see how many (amount) bitcoins are in each pocket, the price of bitcoin during the buy and the total amount of USD paid for the pocket. 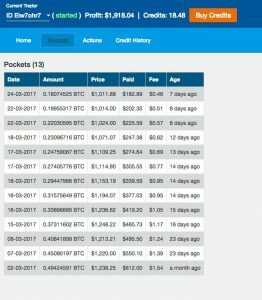 The fee paid to the bitcoin exchange for the transaction is also shown, this is typically 0.25% of the USD value of the pocket. In the column age you can see how long ago the pocket was bought. On the actions page you get an overview of all buy and sell actions. For each buy you can see the amount of bitcoins bought and for which price. The buy is stored in a so called pocket. For each optimal sell oppertunity the trader will check which pockets can be sold with enough profit margin. This is decided per pocket. When there is a sell, the overview will show the amount of bitcoins sold, for which price, and for which bitcoin price the pocket was previous bought for. It will also show the profit in USD and the profit margin. Both profit and profit margin are netto (cost of exchange fee is already subtracted). The credit history page show an overview of bought credits and the deducted credits when profit was made. 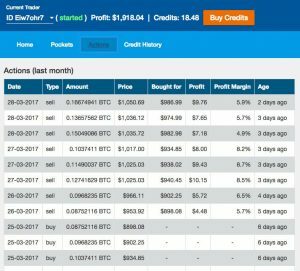 How does the trading engine work? ​Below is an explanation for the trading works. Be assured, you do not need to understand everything. 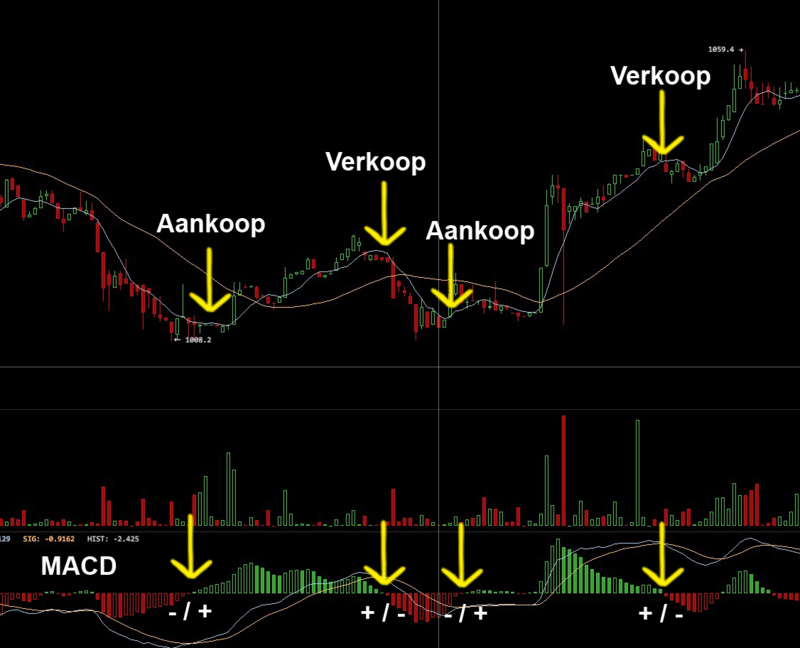 Just keep in mind that the trading engine works fully automatic and buys and sell bitcoins on favorable moments. The trader will only sell bitcoins when it can make a profit. If no profit can be made, it will wait for the next opportunity. The trading engine uses a MACD analyses to determine a favorable moment to buy or sell bitcoins. See also the graph. As you can see a favorable buy opportunities match exactly a MACD crossing from negative to positive. Favorable sell opportunities match MACD crossings from positive to negative. The engine has some additional rules which make sure that good buy and sell opportunities can be found. Sometimes you have a weak MACD crossing which is a good buy or sell moment. When there is a favorable sell opportunity the trader will check for each pocket if it can be sold with enough profit margin. The rule is that we want a minimum profit margin of at least 6%. However, we also want the pockets to be sold within 3 weeks. So the minimum profit margin requirement slowly drops (lineair) to 1% in 21 days. After 21 days the minimum profit margin requirement stays 1%. With the help of many simulations with real historic Bitstamp trading data (> 12 million trades) the trading engine is optimized to maximize the profit made in 1 year.